I am thinking about buying a gsxr 750 k7 2007 in the uk. It has 27k on the clock, and has had various easy mods done to it, screen, levers, bungs, hugger etc, standard stuff. I would only be riding it on the street. It still has the original exhaust on it. I just wondered if anyone had any advice as to what to look for or be aware of please when looking it over? I will be test riding it. Have come from a Fireblade, this will be my first Suzuki potentially. Is 27k a lot for these engines? You see older bikes with more on, just wondered how strong they were engine wise. Does the k7 model have any quirks worth knowing about? 27k is nothing. Use your common sense when test riding it, keep an eye out for any mods that could be 'patch jobs'. Last 'major' service due was due at 24k with valve clearances etc, if they had it done you're laughing. 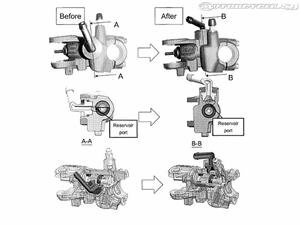 Theres a recall on the master cylinder. Might need to take it in. Those rectifiers are known to fail due to over heating. You will probably want to relocate it before that happens. Go with a K4 or K5 I love them haha. K6 and K7 are the only bikes I'm aware of with "known issues". Thanks for all the replies, really appreciated. 1. It only has a partial service history. From what I can tell no mention of a 24k service / valve clearances done. 2. I take it the secondary butterfly valve is in the exhaust? One mod I would do would be to replace / decat the exhaust as I am assuming it's an easy mod where you lose weight and gain power? Maybe some kind of servo buddy needed? 3. Does the master cynlinder recall still apply, would Suzuki still take it in? Thanks for any further advice. Hopefully I ride it tomorrow. Secondary butterfly is located on the header pipes before the cat, more something to consider as some people completely disable it. You shouldn't need a servo buddy for the cat delete unless you're changing the header pipes. +1 on the master cylinder and reg/rec (common problem is due to it's proximity to the engine; prone to overheating). Easy to relocate if required. Pic of the recall below for, unsure if it would still be honoured but you can do a VIN search on their website? I would be worried that the stock can is still on there with 27k miles. He could be hiding something. Because when I bought my 06 750, it had a sputtering problem that sounded bad after I took the stock exhaust off with an aftermarket. I didn't hear the sputtering at first with the stock exhaust on it, but it definitely had a hesitation issue between 4-8k rpms. Or it could be simply the owner likes quiet. Thanks for the replies everyone, really appreciated. It has not had the valve clearances done so that will be the first thing I get done once I take possession. good, some wear and tear overally but it is not new.